Arriving in Gallup, New Mexico, my mind and heart again went back to 1962 when I was traveling through Gallup and stopped on my way to the Grand Canyon. Visions of the experience floated through my mind. The one clear image was visiting an Indian Reservation. Having read much about the conditions of poverty and poor treatment in reservations, I wanted to see it for myself. The images, I recalled, proved the literature I had read then, as well as the lessons learned in school, to be true. A certain feeling of futility gripped my being. Not exactly the same, but this was the experience with which I was confronted by both white and black people in the South. But, there, I did enter into many discussions and did experience the raw, bloody battles of Civil Rights in 1962. Now, present day, I kept thinking about Theresa and her mother Sarah, and their family. (read about that here). Again, the drive into Gallup was drastically different. There was no four lane highway in 1962. It was America’s Highway… Route 66. Later, I found out this was the old Route 66! 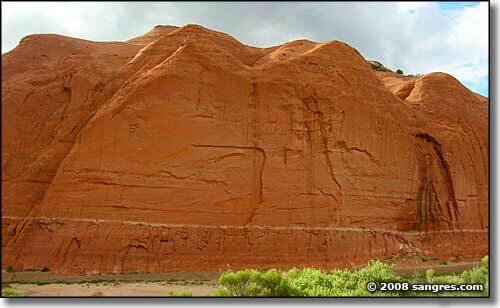 About a half mile off the road was a continuing ridge of red sandstone formations where you could see the various layers. However, it was all red. About three miles later, a sign indicated turn right for Red Rock Park. I drove in and got quite close to the sandstone formation which now appeared mammoth. I drove around and asked the one person I saw where the office was. I received directions that it was right over where that white truck was parked. I walked in to a building which had a sign ‘museum.’ No one appeared to be present. It clearly was a museum. Finally, I reached an office with door open and a person sitting at a desk. She handed me a guide book entitled “Gallup 2015: Visitors Guide.” The Museum was extensive. There were displays with the works of Pueblo and Navajo women, who were so very skilled at basket weaving, precious jewelry, exquisite clothing, and magnificent sand paintings. All, from my perspective, had taken great skill, passed down from generation to generation. A special exhibit about storytelling was on display. Again, it was a long history. Through thousands of years, Native Americans developed civilizations with rich histories, in both the practical skills of living off the land and the remarkable creations all made by hand. Leaving the museum, I drove down to an immense cavernous canyon surrounded on three sides by towering cliffs of brilliant red sandstone. I was in awe. Workmen arrived with additional material to place onto the floor of this gigantic natural place for people to gather. A workman drove up near me in a truck, and I went over and asked for what event they were preparing.